Crew for this race weekend was as for the previous three inshore races of Robin Lawton, brother Peter and myself, ok for the light stuff but not enough weight on the rail if it blew up. We got out to the start area nice and early and did a few time runs from the slack water off Egypt point to the line, all in the one and a half minute area working out from the slack water to the strong tide pushing us over the line. All felt good until just as we started our timed run the wind dropped away to next to nothing making our timed drift a little longer than planned still we crossed the line in the front echelon and proceeded to drift our way up the eastern Solent with the occasional zephyr to fill the kite. Steerage way was a delight when it was there. The drift/run to North Sturbridge was actually reasonably quick with a strong tide under us and fortunately we got there just as the tide was turning. Unfortunately a good number of boats had stretched out quite a lead, we spotted both 31.7s, at least a brace of Sigmas and the biggest boats of our class all beating away from the mark towards Hill Head and disappearing into the distance. The beat to Yarmouth seemed fairly pedestrian, broken by an exciting spinnaker leg across the Solent and spiced up by a building breeze. We just managed to change from the #1 to #3 genoas whilst the kite was up which made the final two beating legs manageable in the rising wind. We felt a decent result had slipped away from us on the downwind leg and so it proved with a 9th position, just in the top half of the fleet . 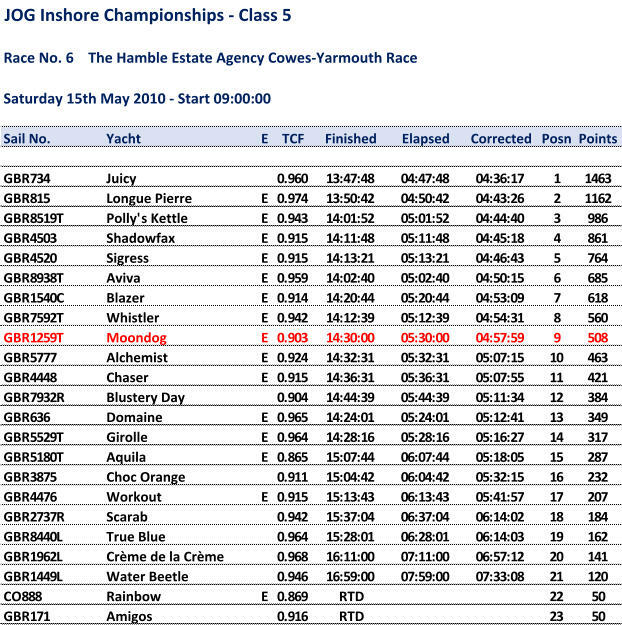 Feeling we could do better with the anticipated mostly downwind legs of the return race we had a good few beers and a meal in good spirits looking forward to Sunday's race back to Cowes.